2Office for National Statistics - 2001 census Population profile - England. 4 ISO 3166-1 is GB, but .gb is unused. The .eu domain is also shared with other European Union member states. England (pronounced IPA: /ˈɪŋglənd/) is a nation in northwest Europe and the largest and most populous constituent country of the United Kingdom of Great Britain and Northern Ireland. Its inhabitants account for more than 83% of the total population of the United Kingdom, whilst the mainland territory of England occupies most of the southern two-thirds of the island of Great Britain and shares land borders with Scotland to the north and Wales to the west. Elsewhere, it is bordered by the North Sea, Irish Sea, Atlantic Ocean, and English Channel. England was formed as a country during the 10th century and takes its name from the Angles — one of a number of Germanic tribes who settled in the territory during the 5th and 6th centuries. The capital city of England is London, which is the largest city in the British Isles, capital of the United Kingdom and one of the world's Global Cities. England ranks as one of the most influential and far-reaching centres of cultural development in the world; it is the place of origin of both the English language and the Church of England, was the historic centre of the British Empire, and the birthplace of the Industrial Revolution. The Kingdom of England was an independent state until 1 May 1707, when the Acts of Union resulted in a political union with the Kingdom of Scotland to create the Kingdom of Great Britain. England's National Day is St George's Day ( Saint George being the patron saint), which is on 23 April. However, compared to other country's national days it is little celebrated. England is named after the Angles (Old English genitive case, "Engla" - hence, Old English "Engla Land"), the largest of a number of Germanic tribes who settled in England in the 5th and 6th centuries, who are believed to have originated in Angeln, in modern-day northern Germany. Their name has had a variety of different spellings. The earliest known reference to these people is under the name Anglii by Tacitus in chapter 40 of his Germania, written around 98. He gives no precise indication of their geographical position within Germania, but states that, together with six other tribes, they worshipped a goddess named Nerthus, whose sanctuary was situated on "an island in the Ocean." The terms Angelfolc, Anglorum and Anglis were all used by Bede in Historia Ecclesiastica Gentis Anglorum (Ecclesiastical History of the English People) when referring to England and the English people. The origin of the word itself is uncertain. It may come directly from the Germanic god Ingwaz or Ingui, and the Ingvaeones federation of which the Angles were part. Bones and flint tools found in Norfolk and Suffolk show that homo erectus lived in what is now England around 700,000 years ago. At this time, part of England was linked to Europe by a large land bridge. The current position of the English Channel was a large river flowing westwards and fed by tributaries that would later become the Thames and the Seine. Archaeological evidence has shown that England was inhabited by humans long before the rest of the British isles because of its more hospitable climate. Tacitus wrote that there was no great difference between these people and and those in northern Gaul. By AD 43, the time of the main Roman invasion of Britain, Britain had already frequently been the target of invasions, planned and actual, by forces of the Roman Republic and Roman Empire. Like other regions on the edge of the empire, Britain had long enjoyed trading links with the Romans and their economic and cultural influence was a significant part of the British late pre-Roman Iron Age, especially in the south. The dominant themes of the 7th to 10th centuries were the spread of Christianity and the political unification of England. Christianity is thought to have came from two directions — Rome from the south and Scotland and Ireland to the north and west. Heptarchy is a term used to refer to the existence (as believed) of the seven petty kingdoms which eventually merged to become the Kingdom of England during the early 10th century. These included Northumbria, Mercia, East Anglia, Essex, Kent, Sussex, and Wessex. The Anglo-Saxon kingdoms tended to coalesce by means of warfare. As early as the time of Ethelbert of Kent, one king could be recognised as Bretwalda, or "Lord of Britain". Generally speaking, the title fell in the 7th century to the kings of Northumbria, in the 8th to those of Mercia, and finally, in the 9th, to Egbert of Wessex, who in 825 defeated the Mercians at Ellendun. In the next century his family came to rule all England. Originally, England (or Angleland) was a geographical term to describe the territory of Britain which was occupied by the Anglo-Saxons, rather than a name of an individual nation state. The Kingdom of England was not founded until the separate petty kingdoms were unified under Alfred the Great King of Wessex, who later proclaimed himself King of the English after liberating London from the Danes in 886. For the next few hundred years, the Kingdom of England would fall in and out of power between several West-Saxon and Danish kings. For over half a century, the unified Kingdom of England became part of a vast Danish empire under Cnut, before regaining independence for a short period under the restored West-Saxon lineage of Edward the Confessor. The Kingdom of England continued to exist as an independent nation-state right through to the Acts of Union and the Union of Crowns. However the political ties and direction of England were changed forever with the arrival of the Norman conquest in 1066. The Norman conquest of England was the conquest of the Kingdom of England by William the Conqueror ( Duke of Normandy), in 1066 at the Battle of Hastings and the subsequent Norman control of England. It is an important watershed in English history for a number of reasons. The conquest linked England more closely with Continental Europe and lessened Scandinavian influence. The success of the conquest created one of the most powerful monarchies in Europe, created the most sophisticated governmental system in Europe, changed the English language and culture, and set the stage for English-French conflict that would last into the 19th century. The events of the conquest also paved the way for a pivotal historical document to be produced - the Domesday Book. The Domesday Book was the record of the great survey of England completed in 1086, executed for William the Conqueror. The survey was similar to a census by a government of today and is England's earliest surviving public records publication. The Norman conquest, to this day, remains the last successful military conquest of England. When the Kingdom of England and the Kingdom of Scotland merged to form the unified Kingdom of Great Britain under the Acts of Union in 1707, both England and Scotland lost their individual political, though not legal, identities. This union has subsequently changed its name twice: firstly on the merger with the Kingdom of Ireland following the Act of Union in 1800 creating the United Kingdom of Great Britain and Ireland in 1801, and then following the secession from the union of the Irish Free State under the terms of the Government of Ireland Act 1920, the United Kingdom of Great Britain and Northern Ireland. Throughout these changes, England retained a separate legal identity from its partners, with a separate legal system from those in Northern Ireland and Scotland, and eventually the strong feelings of the Welsh were acknowledged when it was decided that the name would henceforth be "England and Wales". Wales gained even more of an identity when, like Scotland, it gained its own department within the UK government, the Welsh Office. There has not been a Government of England since 1707 when the Kingdom of England merged with the Kingdom of Scotland to form the Kingdom of Great Britain, although both kingdoms had been ruled by a single monarch since 1603 under James I. Prior to the Acts of Union 1707, England was ruled by a monarch and the Parliament of England. The Scottish and Welsh governing institutions were created by the UK parliament along with strong support from the majority of people of Scotland and Wales, and are not yet independent of the rest of Britain. However, this gave each country a separate and distinct political identity, leaving England (83% of the UK population) as the only part of Britain directly ruled in nearly all matters by the British government in London. In Cornwall, a region of England claiming a distinct national identity, there has been a campaign for a Cornish assembly along Welsh lines by nationalist parties such as Mebyon Kernow. Regarding parliamentary matters, a long-standing anomaly called the West Lothian question has come to the fore. Before Scottish devolution, purely-Scottish matters were debated at Westminster, but subject to a convention that only Scottish MPs could vote on them. The "Question" was that there was no "reverse" convention: Scottish MPs could and did vote on issues relating only to England and Wales. Welsh devolution has removed the anomaly for Wales, but not for England: Scottish and Welsh MPs can vote on English issues, but Scottish and Welsh issues are not debated at Westminster at all. This problem is exacerbated by an over-representation of Scottish MPs in the government, sometimes referred to as the Scottish mafia; as of September 2006, seven of the twenty-three Cabinet members are Scottish, including the Chancellor of the Exchequer, Home Secretary and Defence Secretary. In terms of national administration, England's affairs are managed by a combination of the UK government, the UK parliament, a number of England-specific quangos, such as English Heritage, and the Regional Assemblies (a kind of nascent executive for each English Region). There are calls for a devolved English Parliament, and some English people and parties go further by calling for the dissolution of the Union entirely. However, the approach favoured by the current Labour government was (on the basis that England is too large to be governed as a single sub-state entity) to propose the devolution of power to the Regions of England. Lord Falconer claimed a devolved English parliament would dwarf the rest of the United Kingdom. Referendums would decide whether people wanted to vote for directly-elected regional assemblies to watch over the work of the non-elected Regional Development Agencies. During the campaign, a common criticism of the proposals was that England did not need "another tier of bureaucracy". On the other hand, many said that they were not decentralising enough, and amounted not to devolution, but to little more than local government reorganisation, with no real power being removed from central government, and no real power given to the regions, which would not even gain the limited powers of the Welsh Assembly, much less the tax-varying and legislative powers of the Scottish Parliament (note: Welsh powers are now being expanded). They said that power was simply re-allocated within the region, with little new resource allocation and no real prospects of Assemblies being able to change the pattern of regional aid. Late in the process, responsibility for regional transport was added to the proposals. This was perhaps crucial in the North East, where resentment at the Barnett Formula, which delivers greater regional aid to adjacent Scotland, was a significant impetus for the North East devolution campaign. However, a referendum on this issue in North East England on 4 November 2004 rejected this proposal, and plans for referendums in other Regions (such as Yorkshire) were shelved. Historically, the highest level of local government in England was the county. These divisions had emerged from a range of units of old, pre-unification England (such as the Kingdoms of Sussex and Kent) and further Mediaeval reorganisations (sometimes using duchies such as Lancashire and Cornwall). These historical county lines were usually drawn up before the industrial revolution and the mass urbanisation of England. The counties each had a county town and many county names were drawn from these (for example Nottinghamshire, from Nottingham). Since the latter part of the 19th Century there has been a series of local government reorganisations. The solution to the emergence of large urban areas was the creation of large metropolitan counties centred on cities (an example being Greater Manchester). In the 1990s reform of local government, there began the creation of unitary authorities, where districts gained the administrative status of a county. Today, there exists some confusion between the ceremonial counties (which do not necessarily form an administrative unit) and the metropolitan and non-metropolitan counties. England is now also divided into 9 regions, which do not have an elected authority and exist to co-ordinate certain local government functions across a wider area. London is a special case, and is the one region which currently has a representative authority as well as a directly elected mayor. The 32 London boroughs and the Corporation of London remain the local form of government in the city. 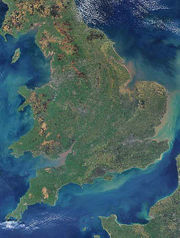 A satellite view of England and Wales. The list of England's largest cities is much debated because in English the normal meaning of city is "a continuously built-up urban area"; these are hard to define and various other definitions are preferred by some people to boost the ranking of their own city. However, by any definition London is by far the largest English city and one of the largest and busiest cities in the world. Manchester and Birmingham now vie for second place. A number of other cities, mainly in central and northern England, are of substantial size and influence. These include: Leeds, Liverpool, Newcastle, Sheffield, Bristol, Coventry, Leicester, Nottingham and Hull. The Channel Tunnel, near Folkestone, directly links England to the European mainland. The English/French border is halfway along the tunnel. England has a temperate climate, with plentiful rainfall all year round, though the seasons are quite variable in temperature. However, temperatures rarely fall below −5°C (23°F) or rise above 30°C (86°F). The prevailing wind is from the southwest, bringing mild and wet weather to England regularly from the Atlantic Ocean. It is driest in the east and warmest in the southeast, which is closest to the European mainland. Snowfall can occur in Winter and early Spring, though it is not that common away from high ground. The highest temperature ever recorded in England is 38.5 °C (101.3 °F) on August 10, 2003 at Brogdale, near Faversham, in Kent. The lowest temperature ever recorded in England is −26.1 °C (−15.0 °F) on January 10, 1982 at Edgmond, near Newport, in Shropshire. 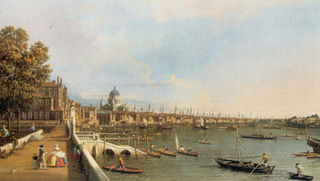 View of the River Thames from the terrace at Somerset House, by Antonio Canaletto. England's economy is the largest of the four economies of the United Kingdom, with 100 of Europe's 500 largest companies based in London. One of the world's most highly industrialised countries, it is a leader in shipbuilding, textiles production and chemical products. The central bank of the United Kingdom, where interest rates are set and monetary policy is carried out, is the Bank of England in London. Tourism is the sixth largest industry in the UK, contributing 76 billion pounds to the economy. It employs 1,800,000 full-time equivalent people — 6.1% of the working population (2002 figures). The largest centre for tourism is London, which attracts millions of international tourists every year. London is also home to the London Stock Exchange, the main stock exchange in the UK and the largest in Europe where shares and bonds are bought and sold. As part of the United Kingdom, England is a major centre of world economics. Its capital London, is an international leader in finance and the largest financial centre in Europe. 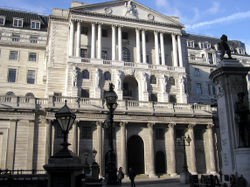 England follows the Anglo-Saxon economic model, and is home to the Bank of England. London, the nation's capital exports mainly manufactured goods and imports things such as petroleum, tea, wool, raw sugar, timber, butter, metals, and meat. England also exports large amounts of meat, exporting over 30,000 tonnes of beef last year, worth around £75,000,000, with France, Italy, Greece, the Netherlands, Belgium and Spain being the biggest importers of beef from England. As part of the United Kingdom, England's official currency is Pound sterling (also known as British pound). England is both the most populous and the most ethnically diverse nation in the United Kingdom with 50,431,700 inhabitants, or 83.8% of the UK's total. This would make England the 25th largest country by population if it were a sovereign state. The 2001 census records roughly around 9% of England's inhabitants as being non-white in origin. The country's population is 'ageing', with a declining percentage of the population under age 16 and a rising one of over 65. Population continues to rise and in every year since 1901, with the exception of 1976, there have been more births than deaths. England is one of the most densely populated countries in Europe, with 383 people per square kilometre, making it second only to the Netherlands. There is a debate over the extent to which the population of England (and indeed that of Britain as a whole) is composed of long-standing indigenous stock or descended from various groups of settlers and immigrants who have arrived over millennia. The Cheddar Man has been cited as demonstrating that a substantial proportion of the present day population may be descended from groups that populated the island in prehistory (The Times, 8 March 1997). The often given view of English ethnicity is that it is a mixed one with large influences from various waves of Celtic, Norse, Roman, Anglo-Saxon and Norman invasions. England has a vast culture that encompasses elements both old and new. Modern culture of England is sometimes difficult to identify and separate clearly from the culture of the wider United Kingdom, so intertwined are its composite nations. However, the traditional and historic culture of England is more clearly defined. English Heritage is a governmental body with a broad remit of managing the historic sites, artifacts and environments of England. The English have played a significant role in the development of the arts and sciences. England has played a big part in the advancement of architecture, boasting some of the finest buildings and architecture in the world. England is home to some of the finest mediaeval castles and forts in the world (see Castles in England), including Warwick Castle, the Tower of London and Windsor Castle (the largest inhabited castle in the world and, dating back to the time of William the Conqueror, it is the oldest in continuous occupation). It also has some of the most exclusive country houses and historic homes in the world (see List of historic houses in England). English architects have devised a number of styles over the centuries, including Tudor style architecture, English Baroque, Victorian architecture. Some of the best known English architects include Norman Foster, designer of 30 St Mary Axe (the Gherkin). England is home to the National Gallery, Tate Britain, Tate Liverpool, Tate St. Ives, and the Tate Modern. Significant figures in English art include William Blake, William Hogarth, J.M.W. 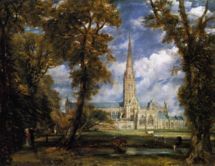 Turner and John Constable in the 18th and early 19th centuries, through to the influential William Morris in the late 19th, to L. S. Lowry during the 20th century, and most recently names such as David Hockney and Damien Hirst in the present day. Non-English dishes such as chicken tikka, korma, stir-fries, and vindaloo are also popular in England. Famous English engineers include Isambard Kingdom Brunel, best known for the creation of the Great Western Railway, a series of famous steamships, and numerous important bridges. Recent English inventors include James Dyson, inventor of the Dual Cyclone bagless vacuum cleaner. English folklore is rich and diverse. Many of the land's oldest legends share themes and sources with the Celtic/Gaelic folklore of Wales, Scotland and Ireland, a typical example being the legend of Herne the Hunter, which shares many similarities with the traditional Welsh legend of Gwyn ap Nudd. Successive waves of pre-Norman invaders and settlers, from the Romans onwards, via Saxons, Jutes, Angles, Norse to the Norman Conquest have all influenced the myth and legend of England. Some tales, such as that of The Lambton Wyrm show a distinct Norse influence, whilst others, particularly some of the events and characters associated with the Arthurian legends show a distinct romano-gaulic slant. The most famous of English folktales concerns the legends of King Arthur, although it would be wrong to associate these stories as purely English in origin as they also concern Wales and to a lesser extent Ireland and Scotland, and therefore should be considered as part of the folklore of the British Isles as a whole. Post-Norman stories include the tales of Robin Hood, which exists in many forms, and stories of other folk heroes such as Hereward The Wake and Dunn of Cumbria who, although being based on historical characters, have grown to become legends in their own right. Finally, other historical figures (such as Sir Francis Drake and 'Drakes Drum') have legends associated with them who move them out of the realm of historical fact and into the realm of mythology. 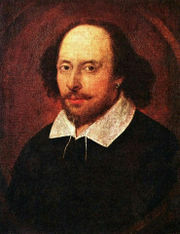 William Shakespeare; an English poet and playwright widely regarded as the greatest writer of the English language, as well as one of the greatest in Western literature. The English language boasts a rich and prominent literary heritage. England has produced a wealth of significant literary figures including playwrights William Shakespeare, [arguably the most famous in the history of the English language], Christopher Marlowe, Ben Jonson, John Webster, as well as writers Daniel Defoe, Henry Fielding, Jane Austen, William Makepeace Thackeray, Charlotte Bronte, Emily Bronte, Charles Dickens, George Eliot, Rudyard Kipling, Virginia Woolf and Harold Pinter. Others, such as Agatha Christie, Enid Blyton and J.K. Rowling have been among the best-selling novelists of the last century. Among the poets, Geoffrey Chaucer, Edmund Spenser, Sir Philip Sydney, Thomas Kyd, John Donne, Andrew Marvell, Alexander Pope, Lord Byron, John Keats, John Milton, Samuel Taylor Coleridge and many others remain read and studied around the world. Among men of letters, Samuel Johnson, William Hazlitt and George Orwell are some of the most famous. Composers from England have often not achieved recognition as broad as that earned by their literary counterparts, and particularly during the nineteenth century were overshadowed in international reputation by other European composers; however, many works of earlier composers such as Thomas Tallis, William Byrd, and Henry Purcell are still frequently performed today, and a revival of England's musical status began during the twentieth century with the prominence of composers such as Edward Elgar, Gustav Holst, William Walton, and Benjamin Britten. In popular music, English bands such as The Beatles, Led Zeppelin, The Rolling Stones, Pink Floyd, The Who, The Kinks, Black Sabbath, Iron Maiden, The Clash, Radiohead, Cream, Oasis and Queen have all been cited as among the most influential and best-selling Rock bands of all time, along with solo artists such as David Bowie, Kate Bush, Robbie Williams and Elton John. England is also credited with being the birthplace of many pop-culture movements such as glam rock, drum and bass, "baggy", grindcore, progressive rock, punk, shoegazing and acid house. Prominent English figures from the field of science and mathematics include Sir Isaac Newton, Charles Darwin, Stephen Hawking, Christopher Wren, and Andrew Wiles. England played an important role in the development of Western philosophy, particularly during the Enlightenment. Jeremy Bentham, leader of the Philosophical Radicals, and his school are recognised as the men who unknowingly laid down the doctrines for Socialism. Bentham's impact on English law is also considerable. Aside from Bentham, major English philosophers include Francis Bacon, Thomas Hobbes, John Locke, John Stuart Mill and Bernard Williams. England, during the nineteenth century, was the location of the codification of a number of modern sports, including association and rugby football (both the union and league codes in rugby football), cricket, tennis and badminton. Of these, association football remains the country's most popular spectator sport. England contains more UEFA grade A stadiums than any other, and is home to some of the sport's top clubs. The England national football team are considered one of the game's superpowers (currently ranked 5th by FIFA and 7th by Elo), having won the World Cup in 1966 when it was hosted in England. Since then, however, they have failed to reach a final of a major international tournament, though they reached the semi-finals of the World Cup in 1990 and the quarter-finals in 2002 and 2006 and Euro 2004 . The England national rugby union team and England cricket team are often among the best performing in the world, with the rugby union team winning the 2003 Rugby World Cup, and the cricket team winning The Ashes in 2005. Rugby union clubs such as Leicester Tigers and the Northampton Saints have had success in the Europe-wide Heineken Cup. At rugby league, the England national rugby league team are to compete more regularly after 2006, when England will become a full test nation in lieu of the Great Britain national rugby league team, when that team is retired after the 2006 Rugby League Tri-Nations. As its name suggests, the English language, today spoken by hundreds of millions of people around the world, originated as the language of England, where it remains the principal tongue today (although not officially designated as such). An Indo-European language in the Anglo-Frisian branch of the Germanic family, it is closely related to Scots and Frisian. As the Anglo-Saxon kingdoms merged into England, "Old English" emerged; some of its literature and poetry has survived. 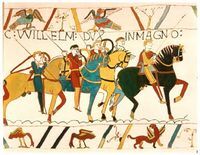 Used by aristocracy and commoners alike before the Norman Conquest (1066), English was displaced in cultured contexts under the new regime by the Norman French language of the new Anglo-French aristocracy. Its use was confined primarily to the lower social classes while official business was conducted in a mixture of Latin and French. Over the following centuries, however, English gradually came back into fashion among all classes and for all official business except certain traditional ceremonies, some of which survive to this day. But Middle English, as it had by now become, showed many signs of French influence, both in vocabulary and spelling. During the Renaissance, many words were coined from Latin and Greek origins; and more recent years, Modern English has extended this custom, being always remarkable for its far-flung willingness to incorporate foreign-influenced words. It is most commonly accepted that because of the legacy and impact of the British Empire, the English language is now the world's unofficial lingua franca, while English common law is also the foundation of legal systems throughout the English-speaking countries of the world. British law does not recognise any language as being official, but English is the only language used in England for general official business. The other national languages of the UK ( Welsh, Irish and Scottish Gaelic) are confined to their respective nations, and only Welsh is treated by law as an equal to English (and then only for organisations which do business in Wales). The only non- Anglic native spoken language in England is the Cornish language, a Celtic language spoken in Cornwall, which became extinct in the nineteenth century but has been revived and is spoken in various degrees of fluency, currently by around 2000 people. This has no official status (unlike Welsh) and is not required for official use, but is nonetheless supported by national and local government under the European Charter for Regional or Minority Languages. Cornwall County Council has produced a draft strategy to develop these plans. There is, however, no programme as yet for public bodies to actively promote the language. Scots is spoken by some adjacent to the Anglo-Scottish Border, and Welsh is still spoken by some natives around Oswestry, Shropshire, on the Welsh border. Most deaf people within England speak British sign language (BSL), a sign language native to Britain. The British Deaf Association estimates that 250,000 people throughout the UK speak BSL as their first or preferred language, but does not give statistics specific to England. Unlike Cornish, BSL is an official language of the UK although most British government departments and hospitals have limited facilities for deaf people. The BBC broadcasts several of its programmes with BSL interpreters. Different languages from around the world, especially from the former British Empire and the Commonwealth of Nations, have been brought to England by immigrants. Many of these are widely spoken within ethnic minority communities, with Hindi, Bengali, Punjabi, Urdu, Polish, Greek, Turkish and Cantonese being the most common languages that people living in Britain consider their first language. These are often used by official bodies to communicate with the relevant sections of the community, particularly in big cities, but this occurs on an "as needed" basis rather than as the result of specific legislative ordinances. Despite the relatively small size of the nation, there are a many distinct English regional accents. Those with particularly strong accents may not be easily understood elsewhere in the country. Use of foreign non-standard varieties of English (such as Caribbean English) is also increasingly widespread, mainly because of the effects of immigration and post-colonialism. There is enormous diversity in religious belief in England, as well as a considerable percentage who profess no religious belief. Levels of religious observance in England have, however, gone into a state of decline. Stained glass from Rochester Cathedral, Kent, England. Note the use of the Flag of England in this work. Christianity reached England through missionaries from Scotland and from Continental Europe; the era of St. Augustine (the first Archbishop of Canterbury) and the Celtic Christian missionaries in the north (notably St. Aidan and St. Cuthbert). The Synod of Whitby in 685 ultimately led to the English Church being fully part of Roman Catholicism. 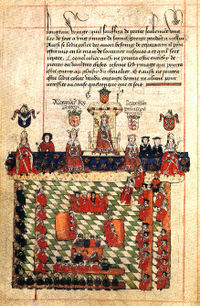 In 1536, the Church was split from Rome over the issue of the divorce of King Henry VIII from Catherine of Aragon. The split led to the emergence of a separate ecclesiatical authority, and later the influence of the Reformation, resulting in the Church of England and Anglicanism. Unlike the other three constituent countries of the UK, the Church of England is an established church (although the Church of Scotland is a 'national church' recognised in law). The 16th-century break with Rome under the reign of King Henry VIII and the dissolution of the monasteries had major consequences for the Church (as well as for politics). The Church of England remains the largest Christian church in England; it is part of the Anglican communion. Many of the Church of England's cathedrals and parish churches are historic buildings of significant architectural importance. Other major Christian Protestant denominations in England include the Methodist Church, the Baptist Church and the United Reformed Church. Smaller denominations, but not insignificant, include the Religious Society of Friends (the "Quakers") and the Salvation Army - both founded in England. There are also Afro-Caribbean Churches, especially in the London area. The Catholic Church re-established a hierarchy in England in the 19th century. Attendances were considerably boosted by immigration, especially from Ireland. Throughout the second half of the 20th century, immigration from South Asia and the Middle East has resulted in a considerable growth in Islam, Sikhism and Hinduism in England. Cities and towns with large Muslim communities include Birmingham, Blackburn, Bolton, Bradford, Leicester, London, Luton, Manchester and Oldham. The Jewish community in England is mainly located in the Greater London area, particularly the north west suburbs such as Golders Green. The British Airports Authority runs many of England's airports, its flagship being London Heathrow Airport, the largest traffic volume international airport in Europe and one of the world's busiest airports, and London Gatwick Airport, the second largest. The third largest is Manchester International Airport, in Manchester, which is run by Manchester Airport Group, which also owns various other airports. Other major airports include London Stansted Airport in Essex, about thirty miles (50 km) north of London and Birmingham International Airport, in Birmingham. The largest airline in England is British Airways, who operate long-distance flights from the UK all over the globe. Others include bmi, Easyjet, and Virgin Atlantic. The British railway system is one of the most dense in the world. It touches nearly every developed area in the country and carries both passengers and freight. The London Underground is the oldest and most extensive underground railway in the world, and currently consists of 253 miles (407 kilometres) of line of line across 260 stations. In October 2006, Transport For London awarded £363 000 000 to the Balfour Beatty and Carillion consortium for the development of a new East London railway. Construction is set to begin in 2007 and is hoped to be completed in 2010, in time for the London 2012 Olympic Games. There is about 4,400 miles of navigable waterways in England, of which roughly half is owned by British Waterways. It is estimated that 165 million journeys are made by people on Britain's waterways annually. As an ethnic group, the English trace their heritage to the Romano-Britons, Anglo-Saxons, the Danish-Vikings that formed the Danelaw during the time of Alfred the Great and the Normans. Regardless of ethnic connotations, the simplest view is that an English person is someone who is from England and holds British nationality, regardless of his or her racial origin. It has, however, been a notoriously complicated, emotive and controversial identity to delimit. Centuries of English dominance within the United Kingdom has created a situation where to be English is, as a linguist would put it, an "unmarked" state. The English frequently include their neighbours in the wider term of "British", while the Scots and Welsh tend to be more forward about referring to themselves by one of those more specific terms. This reflects a more subtle form of English-specific patriotism in England; St George's Day, the country's national day, is barely celebrated. It is believed amongst English nationalist circles that the 'natural culture' of England is comprised of legacies of Brythonic tribes of Celts and Anglo-Saxons appearing in waves of gradual migration. 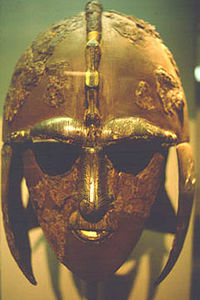 It also is seen as being influenced by the Scandinavian legends such as Beowulf, and by the Norman Conquest. 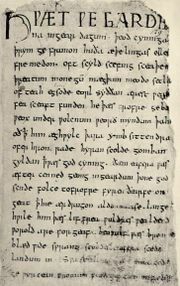 The Anglo-Saxon Chronicle is a common early location for English identity. According to research and the analysis of names in Britain in 2006, the town of Ripley in Derbyshire has the highest proportion of people of ethnic-English origin. The analysis put 42.2 million adult voters in mainland Britain into 200 ethnic groups, based on both given names and surnames. Of Ripley's inhabitants, 88.5 percent have an English-ethnic background. 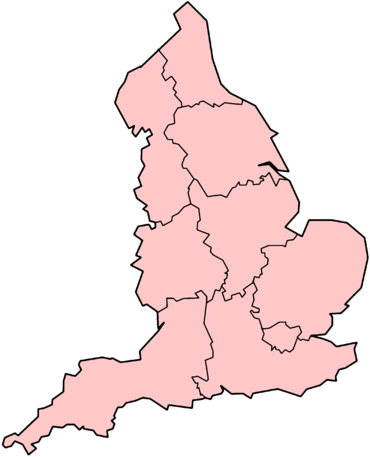 Heanor, also in Derbyshire, was in second place, followed by Sutton-in-Ashfield, Nottinghamshire, and Boston, Lincolnshire. The country is named after the Angles, one of several Germanic tribes who settled the country in the 5th and 6th centuries. There are two distinct linguistic patterns for the name of the country.
" Lloegr" ( Welsh) — but "Saeson" for the inhabitants. Except for Lloegr, which is an ancient geographic term, these names are all derived from the Saxons, another family of Germanic tribes which arrived at about the same time as the Angles. See: Wiktionary:England for a further list of non-English names for England.
" Albion", an ancient name popularised by Pliny the Elder and Ptolemy in the 1st century. Supposedly referring to the white (Latin alba) cliffs of Dover, this term has also been interpreted as a relative of Alba, today the Scots Gaelic name for Scotland. Whatever its origins, "Albion" originally referred to the whole island of Great Britain and is still sometimes seen that way today — but is more often used for England. More poetically, England has been called "this sceptred isle...this other Eden" and "this green and pleasant land", quotations respectively from the poetry of William Shakespeare (in Richard II) and William Blake ( And did those feet in ancient time). The two main traditional symbols of England are the St George's cross (the English flag), and the Three Lions coat of arms, both derived from the great European powers that formed the monarchy – the Cross of Aquitaine and the Lions of Anjou. Also, an icon of the Crown of St. Edward is used on all government and official coat of arms of nearly every public institution and service, as well as some older street furniture. Other National symbols exist, but have varying degrees of official usage. The National Tree of England is the Oak tree, the national flower is the rose, and the national animal is the Lion. The St George's Cross is a red cross on a white background. It is the official national flag of England. In the past it was rarely seen flying, but in recent times has experienced an increase in popularity. It is believed to have been adopted for the uniform of English soldiers during the Crusades of the eleventh, twelfth and thirteenth centuries. From about 1277 it officially became the national flag of England. St George's Cross was originally the flag of Genoa and was adopted by England and the City of London in 1190 for their ships entering the Mediterranean to benefit from the protection of the powerful Genoese fleet. The maritime Republic of Genoa was rising and going to become, together with its rival Venice, one of the most important powers in the world. The English Monarch paid an annual tribute to the Doge of Genoa for this privilege. The cross of St George would become the official Flag of England. A red cross acted as a symbol for many Crusaders in the 12th and 13th centuries. 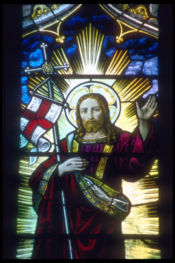 It became associated with St George and England, along with other countries and cities (such as Georgia, Milan and the Republic of Genoa), which claimed him as their patron saint and used his cross as a banner. It remained in national use until 1707, when the Union Jack (more properly known as the Union Flag, except when used at sea) which English and Scottish ships had used at sea since 1606, was adopted for all purposes to unite the whole of Great Britain under a common flag. The flag of England no longer has much of an official role, but it is widely flown by Church of England properties and at sporting events. The Flag of St. George has gained popularity in recent years, and is widely seen flown out of houses, or on cars during important football tournaments in which England is competing. (Paradoxically, the latter is a fairly recent development; until the late 20th century, it was commonplace for fans of English teams to wave the Union Flag, rather than the St George's Cross). The "Three Lions" is the unofficial crest of England and was first used by Richard I (Richard the Lionheart) in the late 12th century (although it is also possible that Henry I may have bestowed it on his son Henry before then). Although the "Three Lions" are not used in any official capacity on their own (e.g. governmental or Royal events), they do feature in the first and fourth quarters of the Royal Coat of Arms of the United Kingdom. However, the arms of both the Football Association and the England and Wales Cricket Board are based on the three lions design. In recent years, it has been common to see banners of the arms flown at English football matches, in the same way the Lion Rampant is flown in Scotland. Historian Simon Schama has argued that the Three Lions are the true symbol of England because the English throne descended down the Angevin line. The Tudor Rose, is a traditional symbol of England. The rose is used in a variety of contexts in its use for England's representation. On technicallity, the rose of England should always be a Tudor, or half-red-half-white rose, symbolising the end of both the War of the Roses and subsequent marriage between the House of Lancaster and the House of York. This is reflected in the Royal coat of arms of the United Kingdom and the crest of the FA. However, the rose of England is often displayed as a red rose (which also symbolises Lancashire), such as the badge of the England national rugby union team. A white rose (which also symbolises Yorkshire) is also used on different occasions. England does not have an official designated national anthem, as the United Kingdom as a whole has " God Save The Queen" as its national anthem. To a lesser extent, Heart of Oak, the unofficial Royal Navy anthem has also been proposed. Music by Dr. William Boyce (1711-1779). English words by the famous actor David Garrick (1716-1779) in 1759.
" God Save The Queen" (the national anthem for the UK as a whole) is usually played for English sporting events (e.g. football matches) against teams from outside the UK (although "Land of Hope and Glory" has also been used as the English anthem for the Commonwealth Games and the England national rugby league team). "Jerusalem" has been sung before England cricket matches. " Rule Britannia" (Britannia being the Roman name for England and Wales combined but also a personification of the United Kingdom) was often used in the past for the English national football team when they played against another of the home nations but more recently "God Save The Queen" has been used by both the rugby union and football teams. The education system in England is run by the Department for Education and Skills, or DfES. The education is split into several types; Private schools provide a paid for education on top of taxes, and are also known as Public or Independent schools, and State schools, funded through taxes. Education is the responsibility of Department for Education and Skills at national level and, in the case of publicly funded compulsory education, of Local Education Authorities. The education structures for Wales and Northern Ireland are broadly similar to the English system, but there are significant differences of emphasis in the depth and breadth of teaching objectives in Scotland. Traditionally the English system emphasises depth of education, whereas the Scottish system emphasises breadth. The Palace of Westminster - the political centre of the United Kingdom. Stonehenge- a Neolithic and Bronze Age megalithic monument in Wiltshire. The White cliffs of Dover, Kent. A portrait of Henry VIII of England, c.1536. The London skyline, as seen in 2005. The Robin Hood Memorial in Nottingham. The Throne room at Buckingham Palace, London. Manchester Town Hall is an example of Victorian architecture found in Manchester, England. The Queen Victoria Statue, at Piccadilly Gardens in central Manchester. Borrowdale in the Lake District- one of twelve National parks of England and Wales. An idyllic/ cliché image of Big Ben, central London. Westminster Abbey; The traditional place of coronation and burial site for English monarchs. York Minster, an Anglican Gothic cathedral in York, Northern England. York Minster is the largest Medieval church in the United Kingdom and the Commonwealth of Nations. The Radcliffe Camera in Oxford.